Technically, the former Fukushima disaster area is now considered safe for human occupation, but unlike the still off limits Chernobyl Exclusion Zone, older residents have been much more reluctant to recolonize. At least that is how it looks to the worst German expatriate clown in Japan. 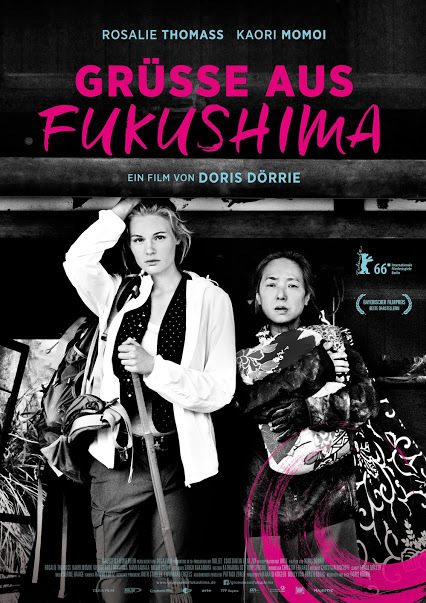 Much to her own surprise, she feels compelled to help Fukushima’s last geisha return to her home in Doris Dörrie’s Fukushima, Mon Amour (trailer here), which screens during the 2016 German Currents in Los Angeles. Reeling from a wedding jilting, Marie has volunteered for the NGO Clowns4Help to bring some joy into the lives of elderly disaster survivors. It was not a well thought-out decision. Frankly, she is not a very good clown and probably an even worse human being. Just when she is about to slink off in disgrace, Satomi convinces the expat to drive her to her now dilapidated house in Fukushima. When Marie realizes Satomi isn’t leaving, she more or less decides to stay as well. The tall German is relatively helpful when it comes to clearing rubble, but she eats a lot. More troubling, her misery acts like a magnet for all the local ghosts. Rather awkwardly for Satomi, this includes her late pupil Yuki, whose death remains a profound source of guilt and angst for the geisha. Mon Amour is very definitely about the figurative and literal ghosts haunting Japan, but it also has a gently absurdist sense of humor. Frankly, giving Marie charm school lessons in the middle of the scarred wasteland really doesn’t seem so outlandish when you are caught up in the moment. After all, they have to do something to pass the time. Kaori Momoi gives an Oscar caliber performance as Satomi. She is an ageless beauty, but also a forceful, no b.s. presence (if you doubt it, watch her steal the show in Miike’s Sukiyaki Western Django). Yet, she also vividly and directly conveys all of Momoi’s pain and remorse, while delivering some surprisingly tart one-liners. She and the gawky Rosalie Thomass make an effective odd couple pairing, but it is an unequal partnership. Nanoko’s Yuki is disconcertingly beautiful and unsettling, duly following the grandly tragic tradition of Japanese movie ghosts. Honsho Hayasaka also adds healthy servings of humility and attitude as Jushoku, the sake-pounding Buddhist monk who is just starting to feel again. (FYI, it is good to know they have regularly serviced sake vending machines conveniently located throughout Japan.) Clowns with Borders founder Moshe Cohen and musician Nami Kamata merit shout-outs as well for being good sports. Essentially playing themselves, they deserve better help than Marie. Hanno Lentz’s absolutely arresting black-and-white cinematography perfectly captures the barren, surreal-in-real-life post-3/11 landscape. This is an elegant, finely tuned film that ought to be playing at more of the Fall film festivals, especially given Dörrie’s considerable international reputation. Very highly recommended, Fukushima, Mon Amour screens tomorrow (10/21) at the Egyptian Theatre, as part of this year’s German Currents.